Barnard's Star, an old and very dim red dwarf, was once thought to have two Jupiter-class planets. This dim star is the second closest to Sol after Alpha Centauri 3. It is located about 6.0 light-years away in the northernmost part (17:57:48.5+04:41:36.2, ICRS 2000.0) of Constellation Ophiuchus, the Serpent Holder -- west of Cebalrai or Kelb al Rai (Beta Ophiuchi). The star was named after its discoverer, noted astronomer Edward Emerson Barnard (1857-1923), who found in 1916 that the star has the largest known proper motion of all known stars (10.3 arcseconds per year). This high apparent speed is the result of its proximity to Sol as well as actual speed of travel through interstellar space. In fact, Barnard's Star is approaching Sol rapidly at 140 kilometers per second (87 miles/second) and will get as close as 3.8 light-years (ly) around 11,800 CE. Like other red dwarfs, however, it is not visible to the naked eye. Due to Barnard's proximity to Sol, the star has been an object of intense interest among astronomers. It was selected as a "Tier 1" target star for NASA's optical Space Interferometry Mission (SIM) to detect a planet as small as three Earth-masses within two AUs of its host star (and so some summary system information and images of Barnard's Star may still be available from the SIM Teams), but the SIM project manager announced on November 8, 2010 that the mission was indefinitely postponed due to withdrawal of NASA funding. Until it was also indefinately postponed, astronomers were also hoping to use the ESA's Darwin group of infrared interferometers to analyze the atmospheres of any rocky planet found in the "habitable zone" (HZ) around Barnard's Star for evidence of Earth-type life (Lisa Kaltenegger, 2005). 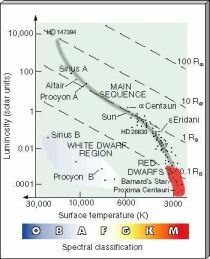 A very cool and dim, main sequence red dwarf (M3.8 Ve), Barnard's Star has less than 17 percent of Sol's mass (RECONS estimate), 15 to 20 percent of its diameter (Dawson and de Robertis, 2004; and Ochsenbein and Halbwachs, 1982, page 529), around 4/10,000th of its visual luminosity -- 0.00346 of its bolometric luminosity (Dawson and de Robertis, 2004), and between 10 and 32 percent of its abundance of elements heavier than hydrogen -- "metallicity" (John E. Gizis, 1997, page 820). According to calculations by Dr. Sten Odenwald, substituting Barnard's Star for Sol would give the Earth such a dim and very red Sun that it would only be 100 times brighter than the Full Moon, and so the planet would freeze solid at the surface. 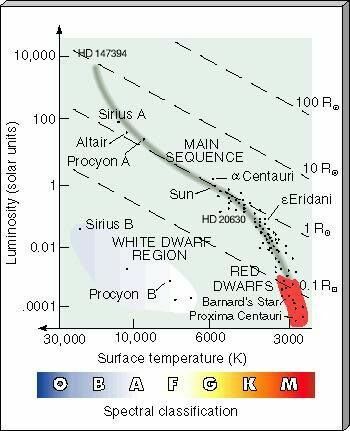 With less than 20 percent of Sol's mass, moreover, Barnard's Star is so small that it can transport core heat to its surface only through convection, unlike larger red dwarf stars like Gliese 752 A -- also known as Wolf 1055 A or Van Biesbroeck's Star (more). 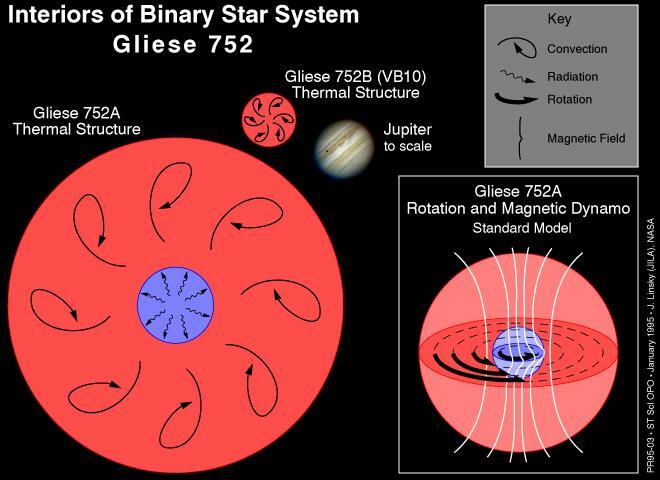 red dwarf stars like Gliese 752 A (more). Unlike Sol, Barnard's appears to be an old star that formed before the galaxy became much enriched with heavy elements (Monet et al, 1992, page 655). Its high space motion and sub-Solar metallicity suggests that the star is an intermediate Population II star," somewhere between a Halo and a disk star (Kürster et al, 2003; and John E. Gizis, 1997). Moreover, its low x-ray luminosity and presumed rotation period of 130.4 days also indicate that it is an old, inactive red dwarf. While the star may be as much as 11 or 12 billion years old (Ken Croswell, 2005), it may last another another 40 billion years or more before cooling into a black dwarf. A small star spot that was shrinking in size may have been observed on Barnard's recently with the Hubble Space Telescope (Benedict et al, 1998). Small periodic variations have been observed which probably result from the "rotational modulation of starspots" (Benedict et al, 1998) and which suggest that the old star rotates slowly (only around once every 130 days) and so should not produce significant flares with regularity from rotational magnetic activity. 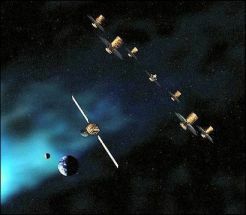 On July 17, 1998, a hot bluish flare lasting at least an hour may have brightened the star by a half magnitude or more (from its magnitude of 9.55), where the flare's temperature was at least 8,000 Kelvin which would be more than double the star's temperature of 3,100 degrees Kelvin (Ken Croswell, 2005 and Paulson et al, 2006). Barnard's has been given the variable star designation V2500 Ophiuchus as well as the New Suspected Variable star designated NSV 9910. Some other useful star catalogue numbers include: V2500 Oph, Gl 699, Hip 87937, BD+04 3561a, LHS 57, LTT 15309, LFT 1385, G 140-24, Vys/McC 799, and Munich 15040. In order to be warmed sufficiently have liquid water at the surface, an Earth-type rocky planet would have to be located very close to such a cool and dim red dwarf star like Barnard's, at around 0.034 to 0.082 AU, the Earth-Sun distance (Kürster et al, 2003). At such close distances, such a planet can easily become tidally locked -- with one side in perpetual day -- and race around the star in 5.75 to 21.5 (or three weeks). According to one type of model calculations performed for the NASA Star and Exoplanet Database, the inner edge of Barnard's habitable zone should be located a little further out from the star, at around 0.056 AU from the star, and the outer edge would lie at around 0.109 AUs. Some astronomers have suggested that any rocky planets that formed around Barnard's are likely to be sparse in the heavier elements of the atomic table, and that there may be a greater probability of gas giants made mostly of hydrogen and helium in cold, outer orbits. Astronomers have long sought to find perturbations ("wobbles") in this star's motion that could be due to planet-sized companions. During the late 1960s, Peter van de Kamp (1901-1995) announced the detection of possibly two coplanar and corevolving planets, whose estimated masses were fine-tuned in 1982 to be about 0.7 and 0.5 of Jupiter's mass with orbital periods of 12 and 20 years, respectively, in "approximately" circular orbits based on astrometric positions obtained from 1938 to 1981 (van de Kamp, 1982). Until his death in 1995, Van de Kamp devoted most of his life (at at Sproul Observatory at (Swarthmore College) to analyzing over 2,000 plates of Barnard's Star that he and his students had taken from 1938 through 1981. Between 2000 and March 2006, a team of astronomers engaged in several years of high-precision radial velocity observations of Barnard's star that set even stricter limits on any large planets in circular orbits around this small star (Kürster et al, 2006; and Kürster et al, 2003). Within 1.8 AUs around Barnard's star, the data up through 2005 appear to exclude planets with minimum masses greater than five (4.9) Earth-masses and a true mass greater than Uranus'. In addition, a cold debris or dust disk has not been detected (Lestrade et al, 2010; and Gautier et al, 2007). The following star systems are located within 10 ly of Barnard's Star. Try Professor Jim Kaler's Stars site for other information about Barnard's Star at the University of Illinois' Department of Astronomy. Up-to-date technical summaries on Barnard's Star can be found at: the Astronomiches Rechen-Institut at Heidelberg's ARICNS, the NASA Star and Exoplanet Database, and the Research Consortium on Nearby Stars (RECONS) list of the 100 Nearest Star Systems. Additional information may be available at Roger Wilcox's Internet Stellar Database. One story is that the Ancient Greeks named this constellation after Aesculapius (the first doctor, a son of Apollo and Coronis, and grandfather of Hippocrates, the famous Greek physician). Aesculapius was killed by Zeus at the urging of Hades for threatening to make mankind immortal like the gods by bringing the dead back to life. In admiration of the doctor's skills, however, Zeus raised the doctor and the serpent from which he had first learned the medicinal usefulness of certain herbs into the heavens. Located along the equatorial region of the sky, Ophiuchus is one of the larger constellations. For more information and an illustration of the constellation, go to Christine Kronberg's Ophiuchus. For another illustration, see David Haworth's Ophiuchus. Project Daedalus was developed by the British Interplanetary Society in the 1970s as a study proposal to send an unmanned, nuclear-powered spacecraft to Barnard's Star. Accelerating to one-tenth light speed using a deuterium/helium-3 nuclear fusion reaction to provide thrust, Daedalus was designed to put a sensor platform in orbit around Barnard's Star, enabling it to return data images just 56 years after its departure from Earth. For more information, go to Starship Daedalus Llinks or Adrian Mann's Starship Daedalus pages which include color illustrations of the proposed interstellar spacecraft -- see also Joe Bergeron's Daedalus Starship.